Just a few weeks in and already behind-the-scenes photos of a new Harley Quinn costume from Birds of Prey (and the Fantabulous Emancipation of One Harley Quinn) have found their way onto the internet. The photos surfaced on Twitter on Tuesday, and seemingly allow for some interesting theories about Harley’s Birds of Prey story arc. The Birds of Prey film has been a long-gestating project, with confirmation that at least one Harley Quinn spinoff film would be happening in the wake of the 2016 premiere of Suicide Squad. Since then, developments on Birds of Prey have included the casting of Mary Elizabeth Winstead as Huntress, Jurnee Smollett-Bell as Black Canary, Ewan McGregor as Roman Sionis, Rosie Perez as Renee Montoya, and Chris Messina as Victor Zsasz, in addition to Margot Robbie reprising her role as Harley Quinn. Shortly after casting was confirmed, the full, official title of the spinoff was confirmed as well as the news that Cathy Yan, who has directed one film previous to her hiring, was brought on board as director. 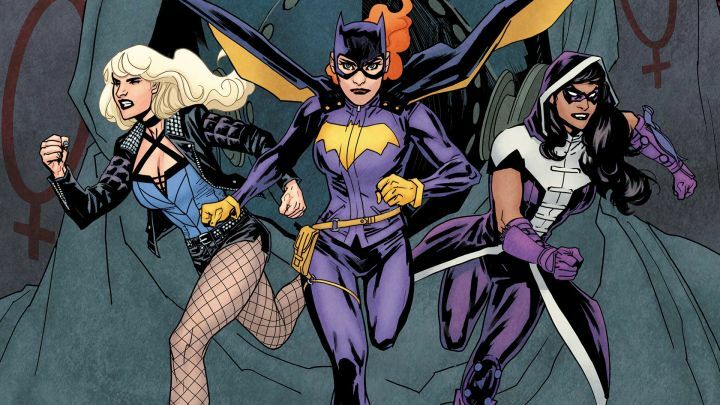 The excitement around Birds of Prey and what fans could expect from the upcoming film culminated earlier this week with the release of a very brief teaser offering a first look at the primary cast members in costume, and making good on Robbie’s earlier hints that Birds of Prey wasn’t going to be too serious in tone. First tweeted out by Twitter account Harley Quinn Updates, two photos taken from different angles show Robbie wearing a totally new Harley Quinn costume. It’s decidedly patriotic, with red and white pinstripe pants, a blue and silver sequin coat, and, as revealed in the front view, a blue star bikini top and a red star painting on her stomach for good measure. Interestingly, Harley’s signature pigtails have been ditched in favor of a messy, blue bun. Given that this is a photo taken from the set and in between takes on Bird of Prey, it’s hard to tell what scene Robbie is filming for or what the story is that would require this ensemble. That said, it’s refreshing to see Robbie sporting pants as part of a Harley Quinn outfit for a change and opting for a new hairstyle. Given the changes to Harley’s look from this costume alone, it’s safe to guess that Harley might be reshaping her identity as she embarks on the “emancipation” alluded to in the title and joins forces with Huntress and Black Canary. 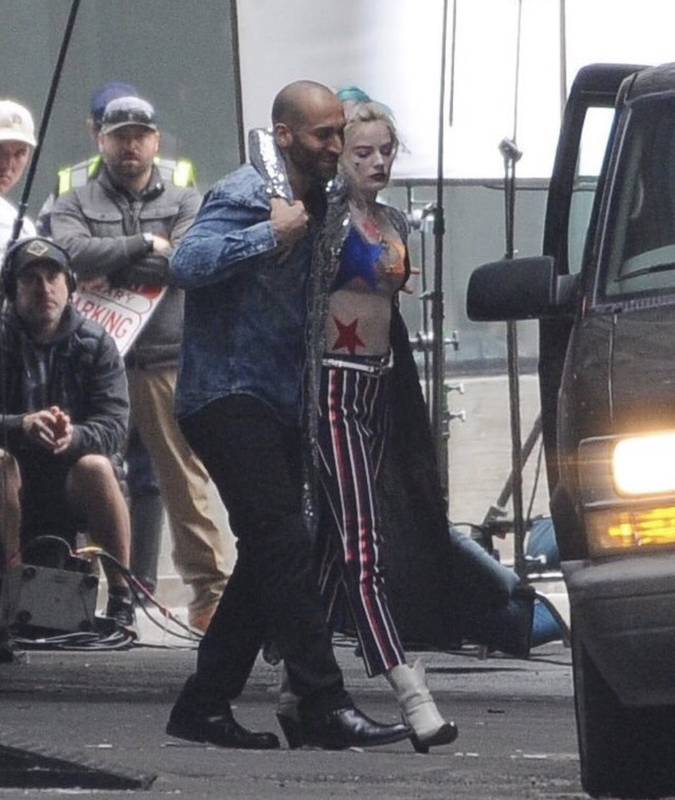 Since Robbie took on the role of Harley Quinn for Suicide Squad, viewers have seen plenty of new looks for one of the DCEU’s key antiheroes, many of them diverging from the traditional harlequin costume originally seen on Harley Quinn in both comics and Batman: The Animated Series. This new look at Harley Quinn and the character she could transform into when she’s not deeply tied to the Joker is refreshing, to say the least. With Harley still acting as the most prominent character in all of these early looks at Birds of Prey, fans are being given a lot to chew on when it comes to considering Harley as an independent, free-wheeling character – something that’s hinted at through all of her new costumes, the hints that have been dropped about the tone of the film, and even the extended Birds of Prey title. If anything, these early photos and teasers prove one thing: emancipation is a good look for Harley Quinn. Kaley Cuoco to Play Harley Quinn in New DC series!